Get to know all the latest updates and news surrounding Santa Fe Trail Days! The Buffalo are Back in Town! ​Two roaming herds of buffalo have been sighted heading towards Larned just in time for the 25th Annual Santa Fe Trail Days weekend and 2nd Larned All School Reunion. The last time they traveled through Larned was in 2004. 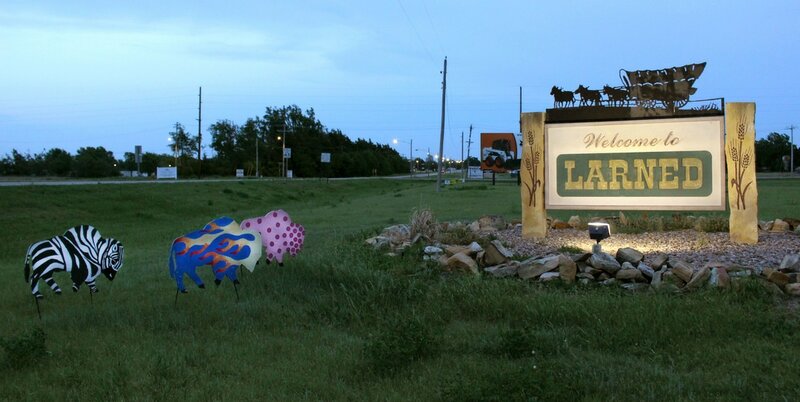 In honor of the upcoming festivities, two herds have decided to venture back to Larned to help us celebrate. 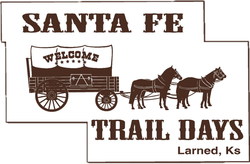 Starting Monday, May 22nd, both herds of buffalo are expected to arrive inside Larned city limits and begin wandering throughout town bringing excitement and traditional for the 25th Annual Santa Fe Trail Days and 2nd Larned All School Reunion! Each herd will need a minimum of 24 hours to fully rest and recuperate from their travels. After that period, they will be ready and eager to move onto greener yards. Wednesday, June 7th will be the last day the herds will roam throughout town. The herds will be picked up that night and will later be found resting and grazing on the Courthouse Lawn, so they can get front row seats for the weekend events. Once a herd makes its way to one yard, that host family has the opportunity to send the herd to another’s yard for $25. Yard Insurance is available for $30 to those wishing to protect their lawn from buffalo grazing on their green grass. The buffalo host families may call the Chamber office to coordinate the next stop of the herd’s journey. These buffalo haven’t roamed the streets of Larned in 13 years. If you see one of the herds around town, take pictures of or with the herd to welcome them to town and encourage them to come back again in the future. When taking pictures or interacting with the herd, please be respectful for the owners yard, as well as the buffaloes own personal space – they are wild animals! If you wish to help us document the herd’s travels throughout town, please tag us on social media, so we can inform others of their journey. We encourage you to like our Larned Area Chamber of Commerce and Santa Fe Trail Days 2017 Facebook pages and stay up-to-date with local events and updates. If you are interested in purchasing Yard Insurance, sending one of the herds to someone, or have questions regarding the Traveling Buffalo, please contact the Larned Area Chamber of Commerce office at 285-6916, or larnedcofc@gbta.net. A special thanks to each and everyone of you who helped make Santa Fe Trail Days possible! We finished up our 24th year and could not have done it without you! A big thanks to every volunteer, sponsor and organization that worked hard to make Santa Fe Trail Days a 3 day fun-filled event. 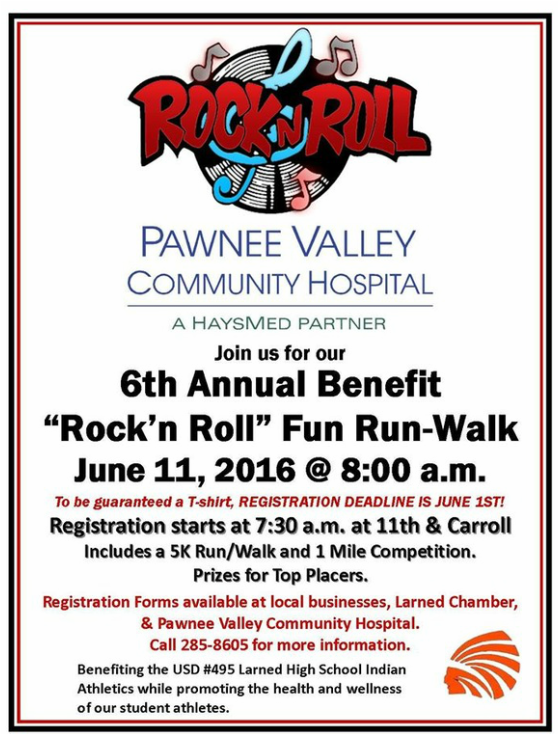 ​The Pawnee Valley Community Hospital will be hosting the 6th Annual Benefit "Rock'n Roll" Fun Run/Walk during Santa Fe Trail Days on Saturday, June 11th at 8:00 am. The run/walk will benefit the USD 495 Larned High School Indian Athletics while promoting the health and wellness of its student athletes. To be guaranteed a t-shirt, registration deadline is June 1st. There will be prizes for top placers. Registration forms are available at local businesses, the Larned Area Chamber and PVCH. Registration on race day will begin at 7:30 am at 11th and Carroll. Call 620-285-8605 for more information. 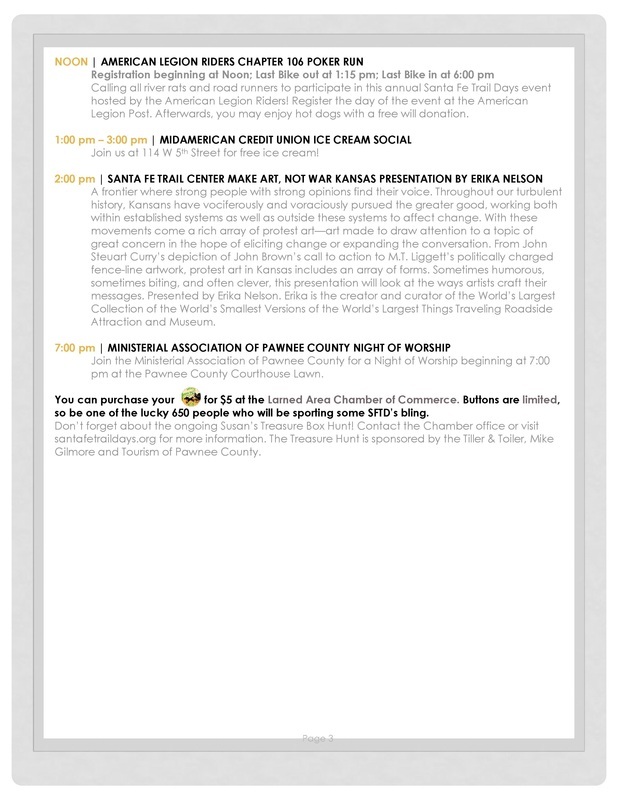 The Santa Fe Trail Days schedule for June 10th-12th is here! Sign Up Today To Participate In The SFTD Parade! The Santa Fe Trail Days Parade is a great opportunity to showcase your organization/business while having some fun! The parade will be located on Broadway, a barricaded section in front of Larned’s downtown businesses, and will be held during Santa Fe Trail Days on Saturday, June 11th at 11:00 am. Check in and line up will begin at 9:30 am. For an entry form and/or more information please contact the Chamber at 620-285-6916 or sblanton@gbta.net or you may visit santafetraildays.org. Purchase this year's 2016 Santa Fe Trail Day button today for only $5! 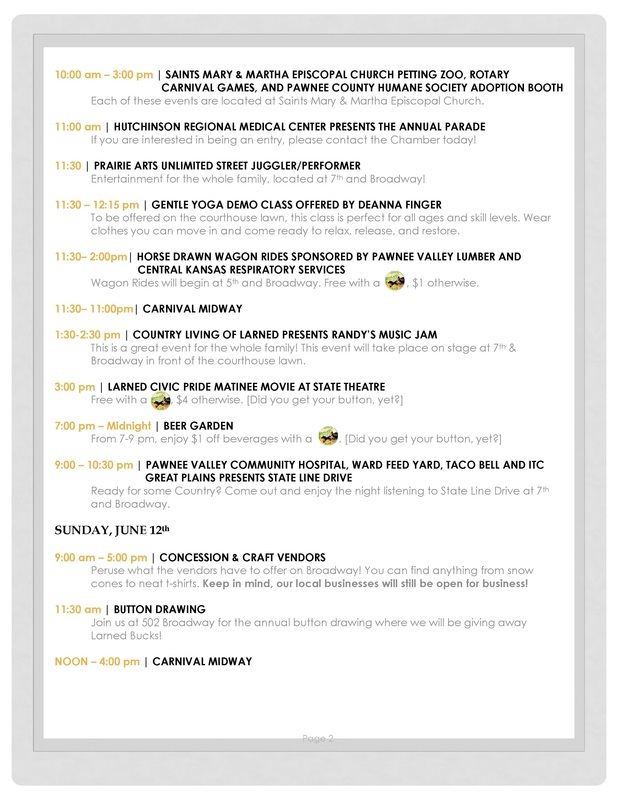 Check out the schedule at santafetraildays.org for a complete list of events and benefits associated with the button! You can purchase your button for $5 at the Larned Area Chamber of Commerce. Buttons are limited, so be one of the lucky 650 people who will be sporting some SFTD’s bling. 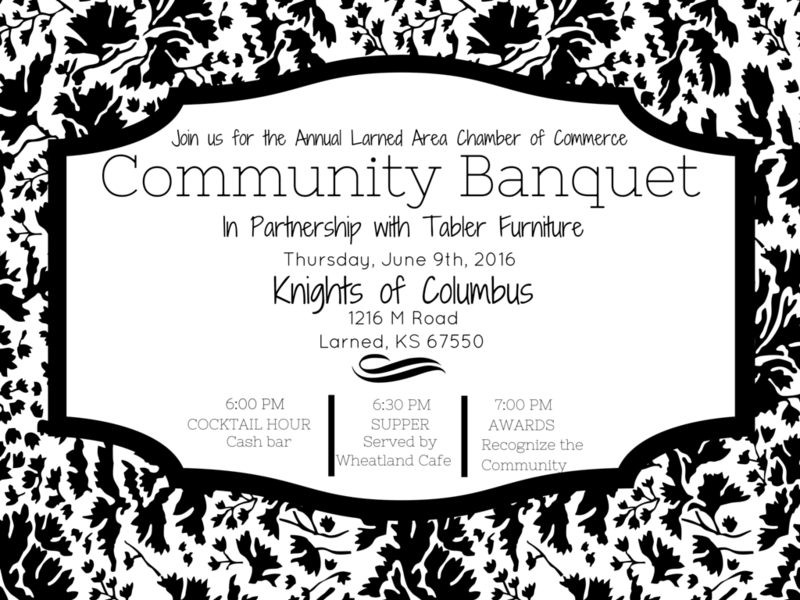 You Are Invited to the Annual Community Banquet Sponsored by Tabler Furniture! This year’s Santa Fe Trail Days will lead off with the Annual Community Banquet on Thursday, June 9th. This special event, sponsored by Tabler Furniture, is held to recognize the inspiring individuals, businesses, and organizations of our community. During the banquet, awards will be given to those featured as this year's: Large Business, Small Business, Organization/Non-profit, Volunteer, Emerging Leader, and Empowering Leader. Tickets are $20 a person. To purchase your tickets, you may contact the Chamber at (620) 285-6916. Visit our Banquet page for more information. ​Hitch your wagon and head on over to Larned, Kansas on June 10th, 11th, and 12th for three days of fun! 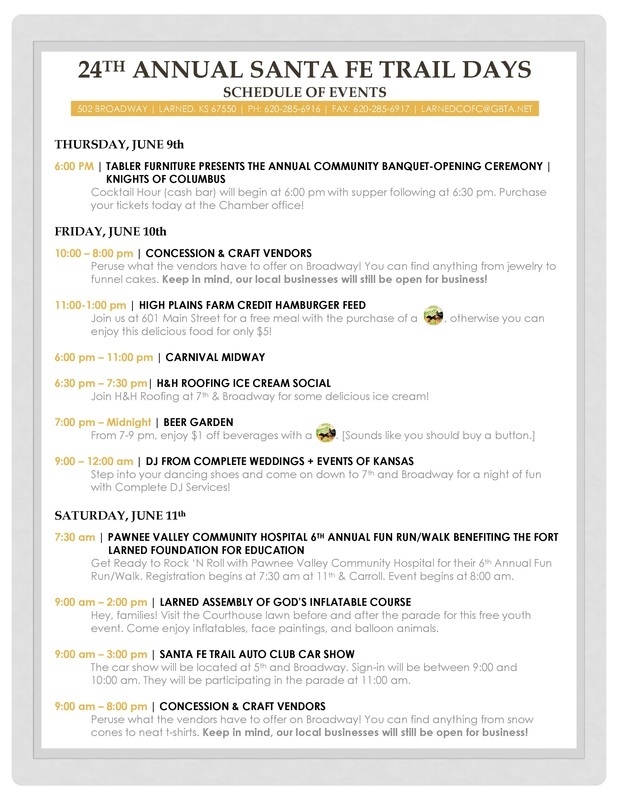 This annual community event features: carnival fairway, live music, beer garden, hamburger feed, concession and craft vendors, parade, car show, movie, ice cream social, poker run, scavenger hunt, and much more! Santa Fe Trail Days is entering its 24th year and we couldn’t be more thrilled! It’s an event you don’t ever want to miss. Hosted by the Larned Area Chamber of Commerce, the Chamber strives to improve the quality of life for the citizens of Pawnee County, making it a better place to live, work and play. This year’s event will lead off with the Annual Community Banquet on Thursday, June 9th. This special event, sponsored by Tabler Furniture, is held to recognize the inspiring individuals, businesses, and organizations of our community. During the banquet, awards will be given to those featured as this year's: Large Business, Small Business, Organization/Non-profit, Volunteer, Emerging Leader, and Empowering Leader. Tickets are $20 a person. To purchase your tickets, you may contact the Chamber at (620) 285-6916. Thanks to our many wonderful sponsors, the Chamber continuously works to bring new, unique activities to Santa Fe Trail Days. This year, we have added a DJ on Friday night, a gentle yoga demo class on Saturday along with horse drawn wagon rides and Randy’s Music Jam. For more information on this event, and for a complete schedule, please visit our event page at http://www.santafetraildays.org/. Mark your calendars for June 10-12th, 2016 and we will see you there! The Larned Area Chamber of Commerce works creatively to find innovative ways to improve the business atmosphere in Larned and surrounding areas. Learn more at larnedks.org. And be sure to like the Larned Area Chamber of Commerce page on Facebook and Twitter.